In fact, all of us are pretty stubborn. If something changes, we complain a lot (see Facebook's reformats the last few years). If we say we aren't stubborn, we're being stubborn about not being stubborn. While working for a interior signage company, my stubbornness was addressed early on. I don't like to multitask. If I'm given a job or task, I don't like to be interrupted. I like getting in a groove. The requirements of the job, however, needed me to be able to drop something quickly to help my co-workers with a more demanding project or simply a task that needed more than one person. I was interrupted all the time. I hated it. I don't like "time-is-money" mentality. Over the 6 years I worked at the shop, I got accustomed to the rhythms of the job. I think I worked efficiently for the most part. I had my groove. But once in awhile, when either my boss or my co-worker came up with a better, more efficient idea to help with workflow, I always resisted, thinking that my way is better. This happens in life ALL THE TIME. We ALWAYS think our way is better than someone else's. Because of the Fall of Adam and Eve, we're cut off. We were made to be in total union with God, in relationship with Him in the purest sense, but we rebelled instead. Thankfully, because of Jesus, we have hope. Hope to be reunited with God again, counted as righteous before him. But we'll stumble along the way. As Christians, we are no longer defined by our sinful nature. We are created in the image of God! We are valued because we look like Him! But, we're still broken. We will continue to sin. 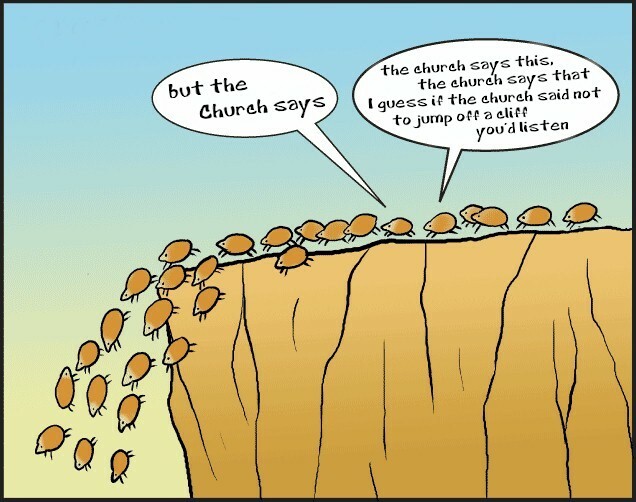 We will trip and fall, like the lemmings in the cartoon. But broken implies that we can be fixed. As believers, we need to kneel before Jesus daily. In addition, as mentioned yesterday, we aren't meant to be loners. We are to be in community as believers. When you read the New Testament, a proper English translation for the word "you" should be "y'all" (something Southerners got right), because our faith isn't supposed to be something you do alone. Confess your lives in vulnerability towards one another. This blog has mentioned that several ways over and over. It's counterintuitive in our culture to "show our weakness." But God uses our weakness against those who claim to be strong. Jesus' Kingdom runs counterintuitive to ALL thoughts on what kingdom, power, and control intend. In our weakness, we are to see in each other the kind of love Jesus has for us. The shame we carry, thinking we are not good enough, is rubbish in the eyes of the man who lifts up our chin and says, "you are mine." Don't be stubborn. If that's not possible, then be stubbornly submissive to the awe-inspiring love and power of Jesus on the cross.